Italian superyacht builder Tankoa Yachts has sold its first Tankoa S501 to an experienced French client. Tankoa Yachts and Yacht-Ology, Michel Karsenti's company, announced the news of the sale. Construction will commence on the 50 metre yacht, built entirely in aluminium light alloy 5083, in April 2015 with delivery slated for April 2017. Tankoa Yachts revealed its new 50m S501 superyacht project in July 2014, and it was officially presented at the Monaco yacht show along with a 70 metre Tankoa S701. Designed by Francesco Paszkowski of Italy, the Tankoa S501 is available in both full-displacement or semi-displacement hull versions. Hull No 1 will be had in the full-displacement version, offering 5,000-nautical-mile range at 12 knots and a top speed of 16 knots. The semi-displacement S501 is predicted to be capable of a 27 knot top speed. The owner came to Tankoa after reportedly investigating a number of European yards. The owner has selected the six-cabin layout for S510 hull No 1, which comprises a main deck, full beam master and VIP suite along with four lower deck guest staterooms. She will also boast a gym, home theatre and a tender garage capable of stowing a seven metre tender. Floor-to-ceiling windows and hydraulic balconies in the master and on the aft deck will provide a close connection to the sea, which was a brief given to Paszkowski's design team. The owner has requested that the interiors be designed by Paszkowski in cooperation with Margherita Casprini, with styling conveying a "modern but warm" atmosphere on board. 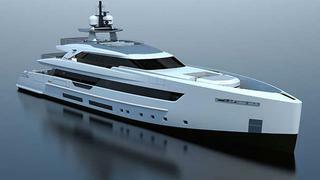 Tankoa Yachts sold an in build S693 superyacht in April 2014, scheduled for delivery in July 2015.